Who doesn't enjoy driving around to view Christmas lights? I think it is just about on everyone's holiday to-do list. 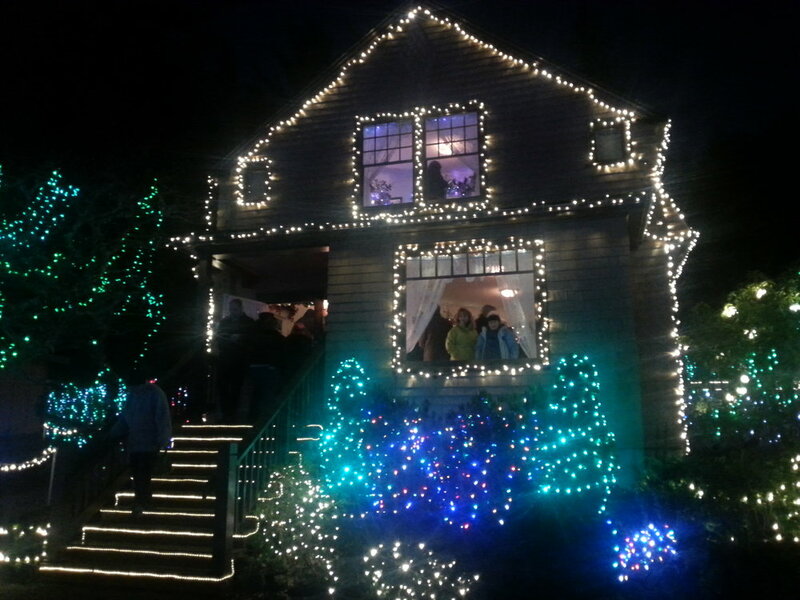 Every year we bundle up, get our hot cocoa, blast the holiday music, and tour the Rogue Valley's holiday lights. Well last year we decided we wanted to go a huge step further and do a Christmas Lights tour not just of the Rogue Valley but all of Southern Oregon! We broke out our google maps and started planning. We decided to start south and make our way around; starting in Medford we headed to Brookings first, then to Charleston in Coos Bay, headed down to Roseburg, and then ended in Grants Pass. Follow along on our winter light adventure as we share where to play, eat, and stay! 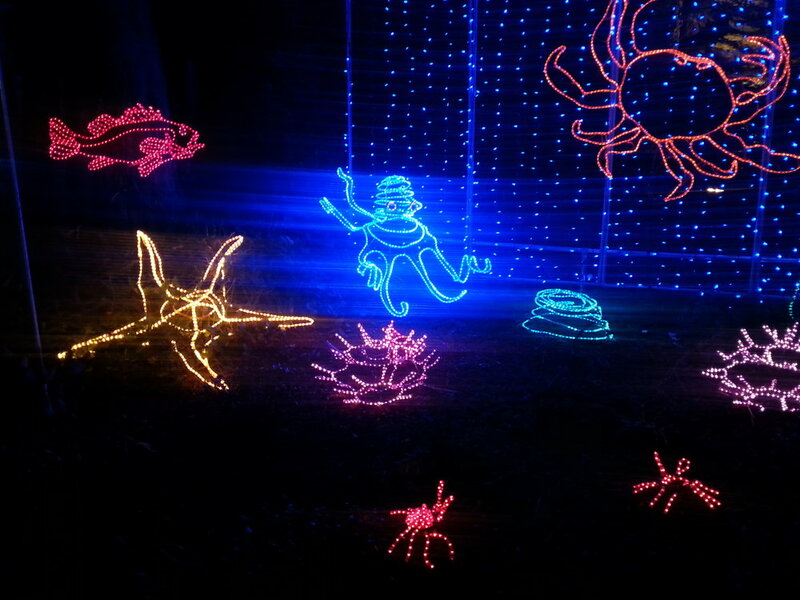 This light display is in Azalea Park and is a fun and festive walking tour. Santa and Mrs. Claus are available for pictures and there is hot cider and cocoa along with cookies for you to enjoy while you cruise around. Since we are often on a budget we love to stay in the yurts at Harris Beach State Park or there are some solid Airbnb options. Breakfast - Superfly Martini Bar & Grill offers a tasty Bloody Mary and good breakfast options, I really like their Huevos Rancheros and Olivia our in house pancake expert approves. Next time we will try their Deep Fried Peanut Butter and Jelly Sandwich, sounds yummy, right?! Lunch - The Hungry Clam has great fish and chips that are crisp and not greasy and they have pretty good Clam Chowder. If you are looking for some of the best clam chowder we have ever had, the Sporthaven Marina Bar & Grill was deliciously creamy with just enough tarragon, and we crave it often. The Fat Irish Kitchen & Pub had a great kids menu and "Fat" sandwiches, just remember that it is a bar atmosphere and your service might be a little slow. Chetco Brewing had a super chill vibe that we loved and the kids had a lot of fun playing various games, food is provided by a vegan food truck that all of us enjoyed. Dinner - Oxenfré is one of our fave spots for dinner with the kids because there food is really awesome with choices like Poutine, Korean Rip Wraps, and Flat Iron Steak and who wouldn't love a place that serves Butterbier (yep the one from Harry Potter). We also enjoy going without the kids for date night because they have great Happy Hour and Late Night menus. Superfly is not only great for breakfast, their lunch/dinner options are yummy; we all loved their Steamed Mussels and their Chicken Bacon Taters are OMG delish! This is a walking tour wending your way through the gardens that are usually blooming with beautiful flowers. I think all of our favorite part was the pond watching the frog jump across. Make sure you stop into the Garden House to enjoy refreshments. Admission is only $5 per car, the state park fee. On this particular trip we chose to splurge a little and stayed in a vintage Airstream at the Oceanside RV Park, but if you are on a budget we love to stay in the Sunset Bay State Park yurts tucked among old growth trees and a stones throw to the beach. Breakfast: Mom’s Kitchen in North Bend is a no frills cafe that serves up home cooked breakfast actually served up by Mom! It is a small spot so you might have to wait a little bit but we loved the locals feel to it. Lunch and Dinner: The Shark Bites Café has fantastic food and is conveniently located downtown; we really enjoyed the fish tacos and craft cocktails and loved perusing the surf shop that happens to be connected. 7 Devils Brewing has a locally inspired menu with a great poutine and especially tasty grilled cheese. Bonus: they had games for us to play with the kids while waiting, there was live music, and we had exceptional service. When you visit Roseburg you can make it a twofer and go to the Zoolights at Wildlife Safari and then drive through the Umpqua Festival of Lights! Tour the Wildlife Safari village that is all lit up for the holidays. You get to also visit with Santa and Mrs. Claus, build your own gingerbread house, and much on cookies while sipping cocoa and coffee. Only on Friday, December 14th through Sunday, December 16th. 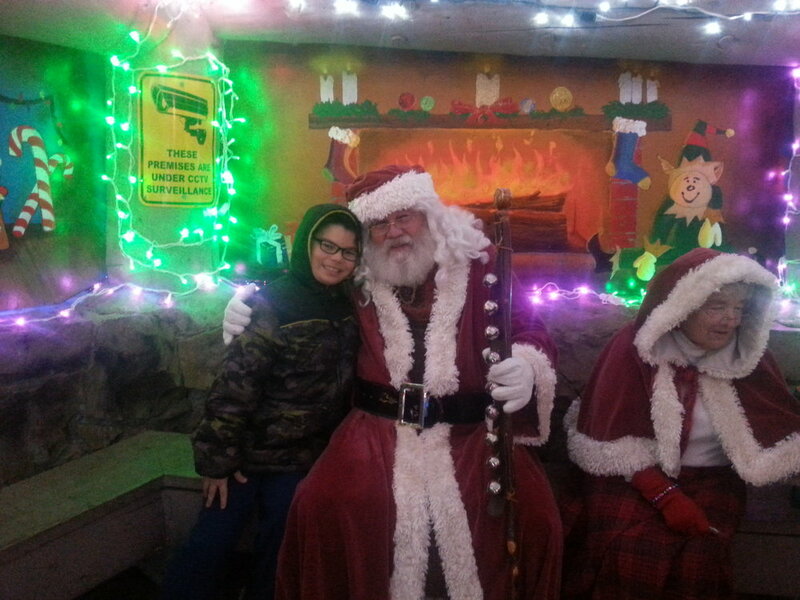 A driving tour through River Forks Park for $10/car or if you go before Christmas you can take a horse-drawn wagon ride for $5 per person, Thursday through Sunday and visit the Holiday Village where you can meet Santa Claus, enjoy treats, and check out their model railroad display. We really enjoyed staying at the Best Western Plus Hartford Lodge in Sutherlin. The rooms were clean and cozy, they had an indoor pool (which the kids loved, of course) and they had a complimentary breakfast complete with chef prepared omelets. Oh, and they gave us each a yummy homemade cookie. Breakfast: We have heard that Brix Grill has good comfort food and a fully stocked bloody mary bar; we will definitely try to go there next time we visit. Lunch & Dinner: We really enjoy True Kitchen + Bar if you are looking for complex dishes with flavors that wow you and awesome cocktails; True is definitely a great date night spot, but there were families there too. Get the Caesar Salad, so good! For even more family friendly options, McMenamin's Station Pub & Brewery offers lots of yummy comfort food options, a full tap of brews to choose from and great cocktails. We also enjoyed Backside Brewing who has a new dining room with really tasty wood-fired pizza (their crust is awe-some!) along with their house made brews, two big screen TV's to watch the games, a pool table, and they also offer a great outdoor seating area! 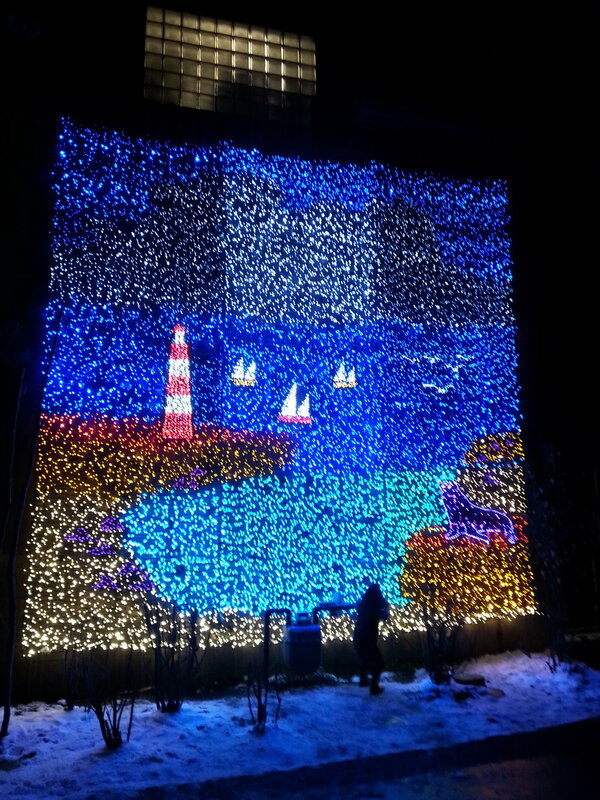 There is no centralized place for Christmas lights per se but if you want to be enchanted we love walking around downtown Grants Pass to checkout their fiber-optic murals, take selfies with their giant nutcrackers, and to view the downtown window displays. Breakfast: MaMosa's is by far our favorite! With locally sourced and sustainable ingredients each dish is well thought out without being over complicated. Make sure to checkout the specials board, they are always yummy, and at least peruse their mimosa menu, so many tasty options! Lunch/Dinner: The Haul offers awesome beer from Connor Field Brewing & handmade cocktails served alongside wood-fired pizzas and locally sourced dishes with international flavors. The Horny Goat has a huge menu offering a little of everything including great vegetarian options. Oregon Pour Authority has some of the best pizza crust we have ever had with yummy toppings and a ton of beers to choose from. Circle J also has amazing pizza and has tons of cool décor to keep every I-spy loving kid occupied while waiting for you grub. We were fortunate enough to attend a couple of years ago and we were blown away. There more than a million and a half lights with displays tucked in every corner. There is also a carousel, Santa on hand for photos, and a lighted train. It was truly enchanting; even our 12 year old enjoyed it. 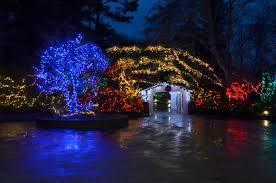 ZooLights runs from November through January 5th. Pricing depends on the dates. After hours the aquarium lights up with over a million lights and decorations. Festivities include gingerbread houses, Santa, and Rudolph the Red Nose Reindeer showings. It runs Friday, November 30th through every Friday and Saturday in December. Cost is $10 or free with same day paid admission. They will also be accepting toy and food donations. A European-Inspired outdoor lights display that includes ice skating, photos with Santa, fire pits, tubing track and more! Open November through December. Save $3 by getting your tickets online in advance. Ilias and Olivia were enchanted by every moment. Make sure to dress warm, it was quite frosty at the coast so you want to make sure to have hats and gloves in addition to your coats so that you can really enjoy your time. Do you know any other cool spots to view lights in Oregon. We want to to know so that we can go; comment below! Happy holidays! We hope you get to enjoy every moment!